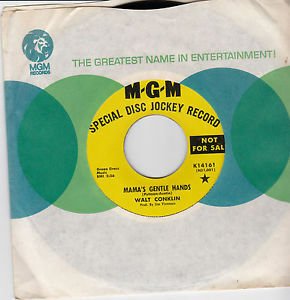 Recent finds include a nice 45 on MGM of a dude named Walt Conklin (no, I’ve never heard of him either) doing a great version of the Willie Nelson classic “Half A Man”. Willie’s original on Liberty was a slow waltz with a full, lush string arrangement, but ol’ Walt reworked it here as an almost shuffle. He sings it high & hard with lusty vibrato, ala Johnny Bush or Curtis Potter. The chord changes are altered a little, to make it work better when played this way. I love it, I think it’s a great version of the tune, and I’ve been playing it with this arrangement at my Lucky Horseshoe shows lately. The overwrought Glen Campbell-ish A-side may not be my cup of tea, but the keen reworking of “Half A Man” makes this 45 a real keeper.